The thickness of the plantar fascia is measured using ultrasonography and has been correlated to either success or failure of conservative treatment depending on how thick the fascia is. The research hypothesis is that the thicker the plantar fascia in a patient diagnosed with plantar fasciitis, the higher the incidence of treatment failure. One hundred thirty six patients from our 4 clinics and 7 podiatric physicians made the clinical diagnosis of plantar fasciitis. The patients were divided into 2 groups for this study. Group 1 included all the patients that had a successful outcome with conservative treatment. Group 2 included all the patients who failed to improve after extensive conservative treatment. The mean for Group 1 plantar fascia thickness was .522 mm. Group 2 included 11.7% of feet and the mean plantar fascia thickness was 1.006mm. The range of plantar fascia thickness was .3mm to .97mm for Group 1. The range of plantar fascia thickness for Group 2 was .67mm to 1.22mm. Based on this study, 1.006 mm was measured to be the mean for Group 2 and may be a useful predictor of treatment outcomes. The thickness of the plantar fascia is measured using ultrasonography and has been correlated to either success or failure of conservative treatment depending on how thick the fascia is [1-13]. The research hypothesis is that the thicker the plantar fascia in a patient diagnosed with plantar fasciitis, the higher the incidence of treatment failure. Conservative treatment in this study includes injection therapy, physical therapy modalities like icing, stretching, prefabricated arch supports, massaging, over the counter anti-inflammatory medications, and orthotics. The null hypothesis states that no matter what the thickness of the plantar fascia it has no effect on success or failure of conservative treatment. What are some of the etiologies of plantar fascia thickness? It has been suspected that inflammation of the fascia occurs. Other etiologies include degenerative changes to the fascia, micro-tearing and scarification of the fascia . Since using ultrasonography, this has been a recent concept in treating plantar fasciitis. In the past, we had no idea there was a thickness issue. According to more recent studies, there is a possible correlation between the thickness of the plantar fascia and the success of conservative treatment . A study published by this author in 1980 found a 90% success rate with conservative treatment and a 10% failure rate. 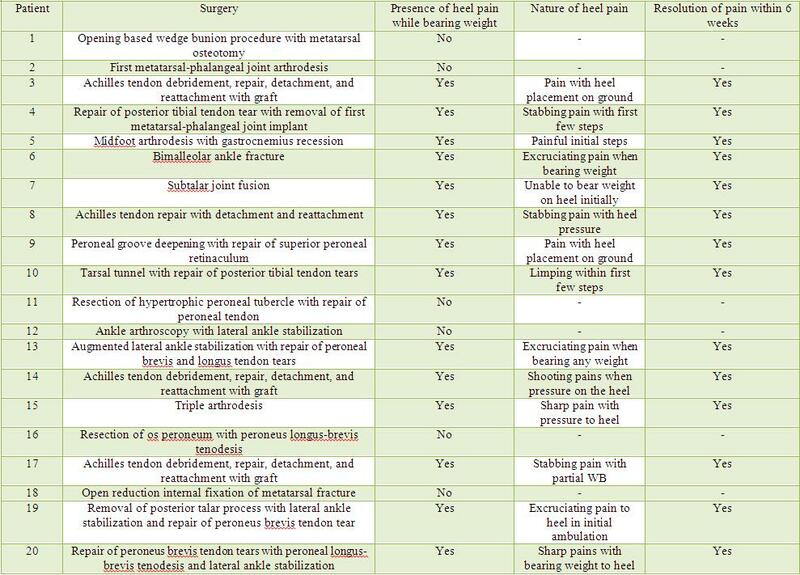 Most of the patient’s in the 10% group elected to proceed with open fascial release to get complete pain relief . Yet, several authors found that a plantar fascia thickness of greater than 4mm was considered thick . One hundred thirty six patients from our 4 clinics and 7 podiatric physicians made the clinical diagnosis of plantar fasciitis. Each patient had their plantar fascia measured using ultrasonography and the thicknesses were recorded. There were a total of 197 feet with the diagnosis of plantar fasciitis. The success or failure of conservative treatment was recorded for all 136 patients. The feet were divided into 2 groups for this study. Group 1 included all the patients that had a successful outcome with conservative treatment. Group 2 included all the patients who failed to improve after extensive conservative treatment. There was no time limit regarding conservative treatment time. Thus, some patients took several months to complete their conservative treatment, whereas others took much longer. A majority of these patients in Group 2 eventually had endoscopic plantar fasciotomy or open fascial releases performed to eliminate their heel pain. The mean thickness of the plantar fascia was calculated for both groups. Using a T test 2 tailed type with a p value of .001 and 95% confidence intervals was calculated. The statistical analysis demonstrated that the two groups were significantly different at a p-value of .0001. Group 1 included 88.3% of feet (174/197). The mean for Group 1 plantar fascia thickness was .522 mm. Group 2 included 11.7% of feet and the mean plantar fascia thickness was 1.006mm. The range of plantar fascia thickness was .3mm to .97mm for Group 1. The range of plantar fascia thickness for Group 2 was .67mm to 1.22mm. Thus, the null hypothesis is rejected and our research hypothesis was accepted. This study corroborates the conclusion of several other studies supporting the concept that the plantar fascia thickness is important and may predict patient conservative treatment outcomes [1-13]. However, the 4mm thickness or greater was not considered significantly thick in this study. Many of the patients in Group 2 had EPF or open fascial release performed. All the patients had no residual heel pain after their surgical sites healed. Others have reported that the plantar fascia in some patients will be thinner after corticosteroid injections . The author plans on doing a study on this topic to determine if this is true or not. Will the thickness also play a role in determining whether the plantar fascia will thin after corticosteroid injections? Will the BMI also be a predictor of outcomes based on thickness of the plantar fascia? One of the concerns of this study was the inability to control the accuracy of the various podiatric physician measurements of the plantar fascia. There is a steep learning curve in accurately measuring the plantar fascia thickness. This was not tested by having each physician measure the same plantar fascia of a dozen patients and determine accuracy of each podiatric physician. It has been suggested that diabetes mellitus has a high correlation with increased plantar fascial thickening . This study did not examine this relationship. Lastly, despite the thickness of the plantar fascia, the patient diagnosed with plantar fasciitis needs to undergo conservative treatment to fulfill the standard of care. How extensive the care is will be determined by the podiatric physician and the patient. Furthermore, there will be exceptions to the findings and conclusions of this study. A patient may be within range of Group 1 yet fail improving after receiving conservative treatment. Contrarily, a patient within Group 2 range completely becomes asymptomatic after completing conservative treatment. This is plausible even though it did not occur in this study. Based on this study, 1.006 mm was measured to be the mean for Group 2 and may be a useful predictor of treatment outcomes. Tsai WC, Chiu MF, Wang CL, Tang FT, Wong, MK. Ultrasound evaluation of plantar fasciitis. Scand J Rheumatol. 2000; 29(4): 255-259. Doi: 10: 1080/030097400750041415. Wearing SC, Smeathers, Sullivan PM, Yates B, Urry SR, Dubois P. Plantar fasciitis: are pain and fascial thickness associated with arch shape and loading? Phys. Ther. 2007:87(8):1002-1008. Genc H, Saracoglu M, Nacir G, Erdem HR, Kacar M. Long term ultrasonographic follow-up of plantar fasciitis patients treated with steroid injection. Joint Bone Spine. 2005;72(1):61-65. Doi:10.1016/j.jbspin.2004.03006. Ozdemir H, Yilmaz E, Murat A, Karakurt L, Poyraz AK, Ogur E. Sonographic evaluation of plantar fasciitis and relation to body mass index. Eur J Radiol. 2005:54(3):443-447/ doi: 10.1016/j ejrad 2004.09.004. Sabir N, Demirlenk S, Yagei B, Karabulut N, Cubukcu S. Clinical utility of sonography in diagnosing plantar fasciitis. J Ultrasound Med. 2005;24(8):1041-1048. Wall KR, Harkness MA, Crawford A. Ultrasound diagnosis of plantar fasciitis. Foot Ankle. 1993;14(8):465-470. 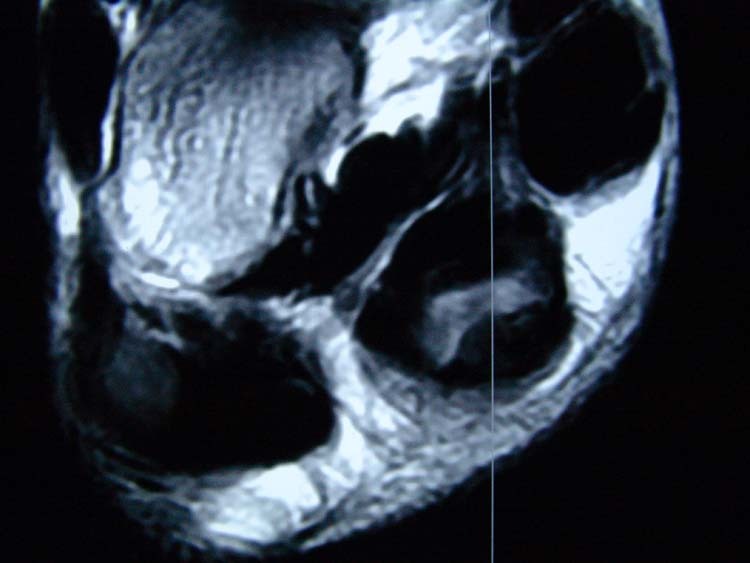 Akfirat M, Sen C, Gunes T. Ultrasonographic appearance of the plantar fasciitis. Clin Imaging. 2003;27(5):353-357. DOI: 10.1016/S0899-7071(02)00591-0. Cardinal E, Chhem RK, Beauregard CG, Aubin B, Pelletier M. Plantar fasciitis: sonographic evaluation. Radiology. 1996;201(1):257-259. Gibbon WW, Long G. Ultrasound of the plantar aponeurosis (fascia) Skeletal Radiol. 1999;28(1):21-26. Doi: 10.1007/s002560050467. Vohra PK, Kincaid BR, Japour CJ, Sobel E. Ultrasonographic evaluation of plantar fascia bands. A retrospective study of 211 symptomatic feet. J Am Podiatr Med Assoc. 2002;92(8):444-449. Hall RL, Erickson SJ, Shereff MJ, Johnson JE, Kneeland JB. 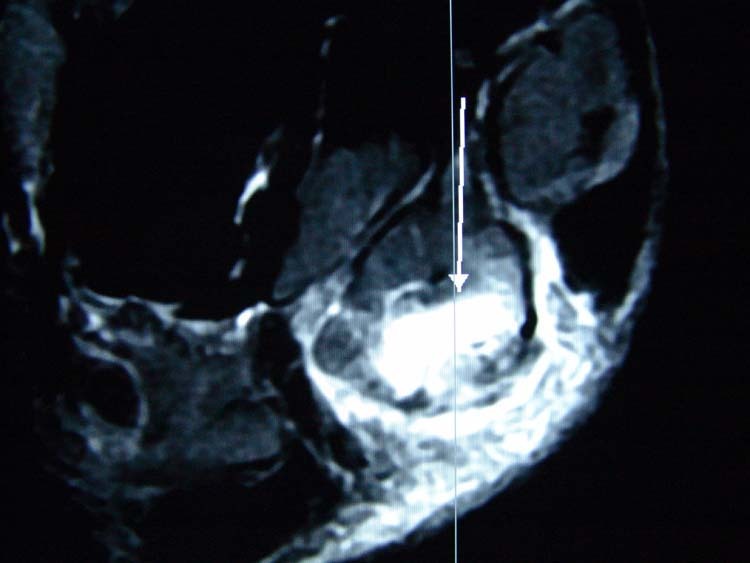 Magnetic resonance imaging in the evaluation of heel pain. Orthopedics. 1996; 19(3):225-229. Kamel M, Kotob H. High frequency ultrasonographic findings in plantar fasciitis and assessment of local steroid injection. J Rheumatol. 2000;27(9):2139-2141. Karabay N, Toros T, Hurel C. Ultrasonographic evaluation in plantar fasciitis. J Foot Ankle Surg. 2007;46(6):442-446. doi: 10.1053/j.jfas.2007.08.006. 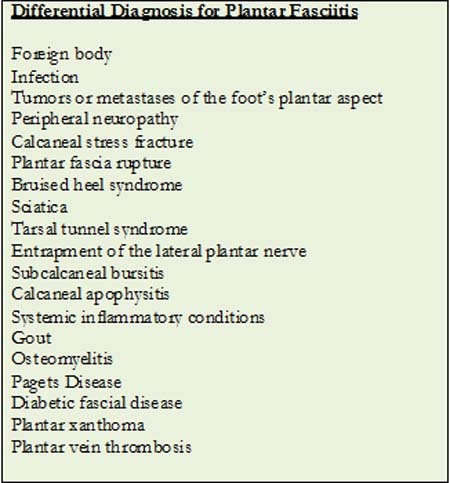 Buchbinder R. Plantar Fasciitis. N Engl J Med 2004:350:2159-66. McMillan AM, Landorf KB, Barrett JT, Menz HB, Bird AR. Diagnostic Imaging for chronic plantar heel pain: a systematic review and meta-analysis. J Foot Ankle Res. 2009; 2: 32 published online 2009 Nov 13. Doi: 10.1186/1757-1146-2-32. Kuwada GT, Gormley J. 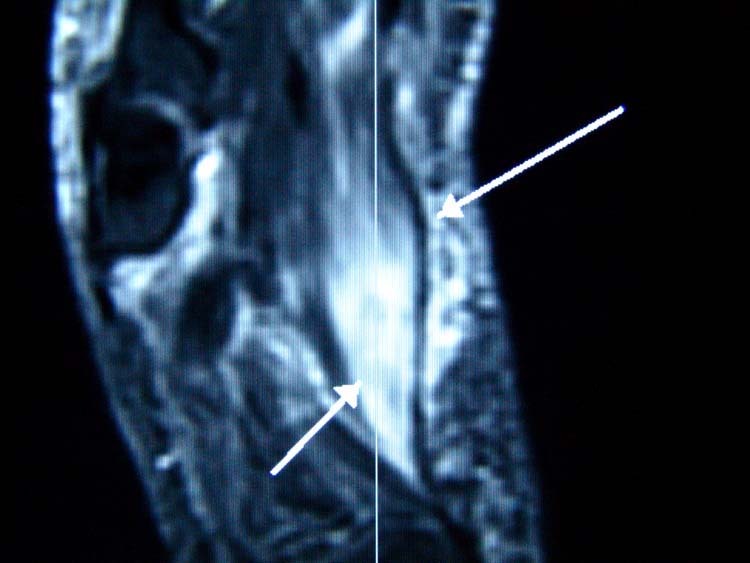 A Retrospective Analysis of calcaneal spur removal and complete fascial release. J Foot Ankle Surg. 1980; 19: 218-222. Background: Plantar fasciitis is one of the most common complaints seen in podiatric practice. Typically, the diagnosis is made based on clinical presentation and patient history. Biomechanics is believed to also contribute to the onset of this condition through a decreased ankle joint range of motion. Methods: The design was a retrospective case-control study of patients with plantar fasciitis (n = 23) and a control group (n = 54). Medical records from the Scholl Foot Clinic at Rosalind Franklin University were abstracted for measurements for ankle joint dorsiflexion with the knee extended and flexed along with other patient variables. Results: Patients diagnosed with plantar fasciitis did not have a significant decrease in ankle joint dorsiflexion (p = 0.8979). A significantly higher body mass index (BMI) was noted in patients diagnosed with plantar fasciitis as compared to the control group (34 +/- 7.99 v. 29 +/-5.81; p = 0.0046). Increased plantar fasciitis was also noted in cavus foot structure (p = 0.0323) and in women (p = 0.0147 for left and p = 0.0250 for right). Conclusions: An increased BMI, cavus foot structure, and female gender were found to be associated with a diagnosis of plantar fasciitis. Key words: Plantar fasciitis, cavus foot, BMI. We hypothesized that patients complaining of plantar fasciitis would have an increased incidence of equinus deformity as compared to a control group of patients who do not complain of symptoms relating to plantar fasciitis and who had no previous history of a plantar fasciitis diagnosis. A retrospective study of patient records was performed at the Rosalind Franklin Student Clinics. The study protocol and procedures were approved by the University’s Institutional Review Board. Consecutive records from the archives were pulled from podiatric patients with a diagnosis code of plantar fasciitis, beginning before and up to March 3rd, 2005 resulting in 48 patient records. 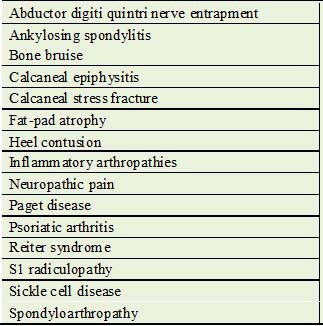 These were selected for review based upon complete record of the following criteria: age, height, weight, occupation, typical shoe gear, what elicited pain for the patient, whether radiographs were obtained and the findings, bilateral ankle joint range of motion (knee extended and flexed) and foot structure. Any chart with incomplete or missing data according to the criteria previously set forth was excluded resulting in a patient population of 23 (17 women and 6 men) with a mean ± standard deviation (SD) age of 49 ± 11 years (range 25 to 69 years). A control group was formed from consecutive patient charts without a diagnosis code of plantar fasciitis or history of ankle joint trauma. These charts were reviewed and included upon complete notation of the following criteria: age, height, weight, occupation, typical shoe gear, bilateral ankle joint range of motion (knee extended and flexed) and foot structure. Following chart review and exclusion criteria a group of 54 patients was formed to serve as the control group with a mean age of 49 ± 11 years (range 18 to 68 years). Data analysis was performed using STATA (version 9.1, College Station, TX) to determine whether a significant difference existed in the prevalence of equinus between the plantar fasciitis group and the control group. Other variables were also analyzed to determine the interrelationship with plantar fasciitis including BMI, gender, shoe gear, foot structure, and occupation. For continuous predictor variables one-way analysis of variance (ANOVA) with Bartlett’s test for equal variance was used. For categorical predictor variables ANOVA with Scheffe’s Post Hoc test was utilized. For dichotomous predictor variables Fisher’s exact test was used. While a trend towards plantar fasciitis patients having decreased ankle dorsiflexion was expected, these findings were not significant (p = 0.8979) (Figs. 1 and 2). Figure 1 Box Plot for Degrees of Dorsiflexion Knee Extended. Figure 2 Box Plot for Dorsiflexion Knee Flexed. Mean dorsiflexion ± SD of the left ankle was found to be -1.91 ± 7.44 with the knee extended and 5.96 ± 7.85 with the knee flexed. For the right ankle these values were -1.74 ± 6.12 knee extended and 6.57 ± 7.19 knee flexed (Table 1). Figure 3 Box Plot for BMI. A similar trend in respect to weight (p = 0.0394) was also noted. An increased incidence of plantar fasciitis was found in those patients with a cavus foot structure (p = 0.0323). An increase in plantar fasciitis was found in women (p = 0.0147 for left and p = 0.0250 for right) (Table 2). No correlation between the patients with plantar fasciitis and their occupation, shoe gear or age was found. In this retrospective study patients with equinus were in fact not found to have a significant difference in the formation of plantar fasciitis (p=0.8979) (Figures 1,2). A trend was noted in increased gastroc-soleal (32% greater) and gastrocnemius equinus (20% increase) as compared to the control group. Despite these trends a statistical significance was not found to exist disproving our initial hypothesis. Although this can be attributed to shoe gear difference when compared to the control group, a trend that did not reach significance could be seen in a larger number of women being afflicted with plantar fasciitis than the more evenly distributed gender of the control group (74% compared to 59%). This study revealed that women had a significant decrease in ankle joint dorsiflexion with the knee extended (p = 0.0147 for left and p = 0.0250 for right). The shoe gear of men versus women was analyzed and no significant finding could be noted. This supports the theory that decreased ankle joint dorsiflexion might be another contributory factor in plantar fasciitis development in women. Foot structure is commonly noted a predictive factor in the formation of plantar fasciitis, pes planus being more susceptible to its formation. [7,8] In this study it was found that pes cavus feet actually had an increased incidence of plantar fasciitis than pes planus feet (p = 0.0323). Other factors such as age, occupation, and shoe gear were analyzed and no significant finding could be noted in the formation of plantar fasciitis. Because patients self report their height and weight there is a potential under or overestimation of the BMI. Recent research however has shown that underestimation is more likely than overestimation in self reported groups. This study was also limited by lack of consistent detail provided by the medical charts this study required, therefore resulting in a reduction in sample size from the initial group of patients diagnosed with plantar fasciitis. However, a larger sample size may have provided the power to detect differences in ankle joint dorsiflexion. A limitation related to the data analysis is that this study used the foot as a unit and rather than using a clustered analysis of feet. The authors hypothesized that a greater incidence of equinus deformity could be found among patients with plantar fasciitis than in those without history of plantar fasciitis. Upon examination of the data it was found that this initial hypothesis could not be supported by the analysis. Females diagnosed with plantar fasciitis were found to have to have a significant decrease in ankle joint dorsiflexion with the knee extended. An increased BMI and weight as well as a cavus foot structure were the only variables that showed a significant increase among all patients diagnosed with plantar fasciitis as compared to the control group. Other variables such as occupation, age, and shoe gear were not found to be of statistical significance when compared to a control group. The results of this study suggest that weight loss should be utilized as a primary conservative treatment for patients diagnosed with plantar fasciitis who have a higher than normal BMI and weight before surgical alternatives are employed. Further prospective study with a larger patient population is warranted ensuring consistent charting and including clinically measured height and weight data. 1. Riddle DL, Pulisic M, Pidcoe P, Johnson RE: Risk factors for plantar fasciitis: A matched case-control study. J Bone Joint Surg 85A: 872 – 877, 2003. 2. Landorf KB, Keenan AM, Herbert RD: Effectiveness of different types of foot orthoses for the treatment of plantar fasciitis. JAPMA 94 (6): 542 – 549, 2004. 3. Ward ED, Smith KM, Cocheba JR, Patterson PE, Phillips RD: In vivo forces in the plantar fascia during the stance phase of gait. JAPMA 93 (6): 429 – 442, 2003. 4. DiGiovanni CW, Kuo R, Tejwani N, Price R, Hansen ST Jr, Cziernecki J, Sangeorzan BJ: Isolated gastrocnemius tightness. J Bone Joint Surg 84A: 962 – 970, 2002. 5. Gheluwe BV, Kirby KA, Roosen P, Phillips RD: Reliability and accuracy of biomechanical measurements of the lower extremities. JAPMA 92 (6): 317 – 326, 2002. 6. Singh D, Angel J, Bentley G, Trevino SG: Fortnightly review: Plantar fasciitis. BMJ 315 (July): 172 – 175, 1997. 7. Richie DH: The best treatments for plantar heel pain. Podiatry Management 135, August 2002. Access date and url is required. 8. Martin JE, Hosch JC, Goforth WP, Murff RT, Lynch DM, Odom RD: Mechanical treatment of plantar fasciitis: A prospective study. JAPMA 91 (2): 55 – 62, 2001. 9. Saxena A, Kim W: Ankle dorsiflexion in adolescent athletes. JAPMA 93 (4): 312 – 314 , 2003. 10. Knutzen KM, Price A. Lower extremity static and dynamic relationships with rearfoot motion in gait. JAPMA 84 (4): 171 – 180, 1994. 11. Nuber GW. Biomechanics of the foot and ankle during gait. Clin Sports Med 7 (1): 1 – 13, 1988. 12. Lavery LA, Armstrong DA, Boulton AJM. Ankle equinus deformity and its relationship to high plantar pressure in a large population with diabetes mellitus. JAPMA 92 (9): 479 – 482, 2002. 13. Wrobel JS, Connolly JE, Beach ML: Associations between static and functional measures of joint function in the foot and ankle. JAPMA 94 (6): 535 – 541, 2004. 14. Winter DA. Kinematic and kinetic patterns in human gait: variability and compensating effects. Human Mov Sci 3: 51 – 76, 1984. 15. Lamm BM, Paley D, Herzenberg JE: Gastrocnemius soleus recession: A simpler, more limited approach. JAPMA 95 (1): 18 – 25, 2005. 16. Riddle DL, Pulisic M, Sparrow K: Impact of demographic and impairment-related variables on disability associated with plantar fasciitis. 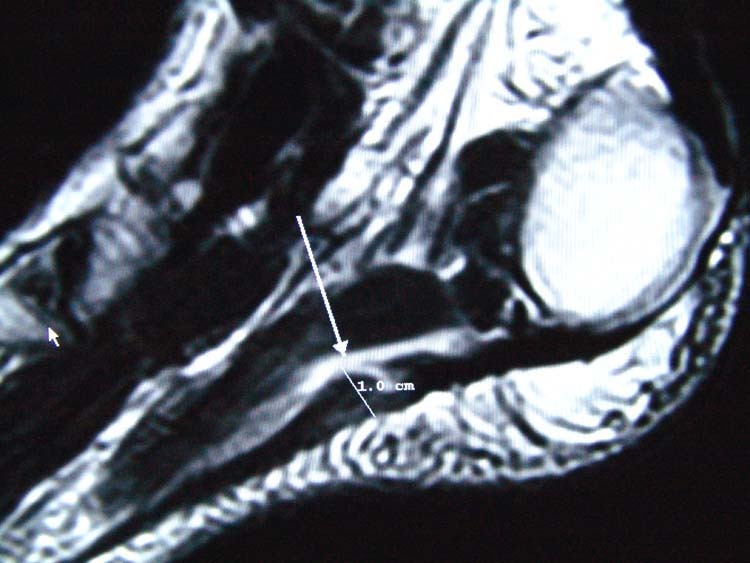 Foot Ankle Int 5: 311 – 317, 2004. 17. Warren BL: Plantar fasciitis in runners: Treatment and prevention. Sports Med 10 (5): 338 – 345, 1990. 18. Bender R, Joekel KH, Trautner C, Spraul M, Berger M: Effect of age on excess mortality in obesity. JAMA 281: 1498 – 1504, 1999. 19. Martin RL, McPoil TG: Reliability of ankle goniometer measurements: A literature review. JAPMA 95 (6): 564 – 572, 2005. 20. Kuczmarski MF, Kuczmarski, RJ, Najjar M: Effects of age on validity of self-reported height, weight, and body mass index: Findings from the third national health and nutrition examination survey. J Am Diet Assoc. 101 (1): 28 – 34, 2001. Address correspondence to: KD Kelly, DPM PGY-2 resident in Podiatric Medicine and Surgery at the Central Alabama Veterans Health Care System in Montgomery, Alabama.